Mount Joy, Pennsylvania (October 12, 2016) – Much like any motorsports operation or organization, success in the Super Cup Stock Car Series is based on much more than a single driver or car. It is a complete team effort. Sometimes flying under the radar from race to race are those that are right there for the season-long ride, and many make up a major piece of the puzzle as part of the group. Crew members and officials can bring an immense amount of first-hand knowledge, an additional opinion, or sometimes simply a helping hand. Occasionally they have countless stories to tell as well. In 2017, Lee Manners will enter his 50th year involved in racing. The member of the Jeff Zillweger team, which finished a career best third in 2016 points, began helping the father of a friend work on a ’33 Plymouth coupe with a six cylinder Hudson engine as a teenager. 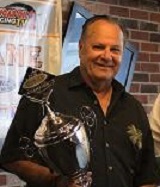 “I have worked on everything from go-karts to Camping World Trucks, Sprint Cars, and everything in between,” Manners, who has helped along with Zillweger at tracks such as Eldora and Gateway with Norm Benning, recalled. The Pennsylvania resident was fortunate enough to go to engineering school with General Motors and received his degree in mechanical engineering, and continued to develop his expertise over the years by assisting teams, mostly at the dirt tracks. Nevertheless, it was at former SCSCS facility Motordrome Speedway that he met Zillweger. Manners plans to continue doing his part to teach what he has learned to Zillweger, who picked up his second Most Improved Driver award in three years, going into next season. Another longtime individual that has been seen in the SCSCS pit area also hails from Pennsylvania. Throughout Kevin Kromer and K2 Motorsports’ tenure since late in the 2008 season, Sam Borger has been wrenching on their cars. His history with Kromer goes back even further than that. 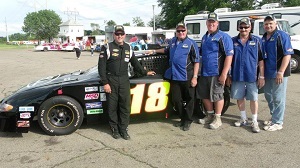 Ever since, Borger has been a mainstay with Kromer’s team, through years of racing Modifieds to the old USAR Pro Cup Series, and present day. At times when help was short, Kevin has always been able to count on Sammy, including visits at the shop during the week. Nowadays, the team gets additional assistance when at the track thanks to the generous help from members such as the Wellek family and Shawn Phillips. Borger went on to mention the positives of being involved in a series like Super Cup. “Everybody there would give you the shirt off their back,” Borger continued regarding the camaraderie in SCSCS. Other situations can come around full circle. 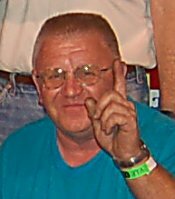 J.P. Booth worked with his friend from Eastern Ohio, Ronnie Souders, when they competed in their local Modified division and then made the move to Pro Cup. 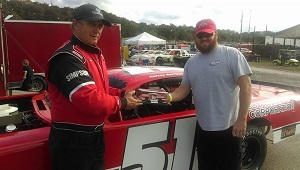 Before they purchased a car, the two of them helped Joe Harrison’s racing effort. 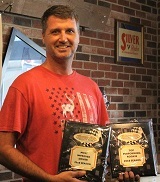 Joe is the brother of 2016 champion Harvey Harrison. 12 years later a visit to a nearby race track started tying everything back to where it started. Since then, Booth has traveled to meet up with the Harrison’s Motorsports team at every event, including a facility he previously called home. Booth went on to point out that it hardly feels like they met Harvey and the entire team less than two years ago. While many may have never stepped behind the wheel of a race car, others with quite the racing careers offer their advice to current drivers. In addition, lending a hand can go further than simply helping one team. 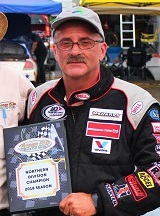 Ohio’s Neil Gacom formerly drove in the Super Cup Stock Car Series, achieving three top fives and 10 top 10s in 15 starts. 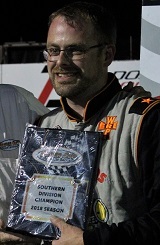 He made his return to the SCSCS pits in 2014 to assist Director of Competition, Joe Schmaling, in which he met prior during his years driving in Pro Cup. 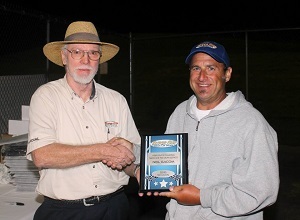 Neil’s SCSCS driving career came to a close after a wreck at Motordrome Speedway in 2010. Harvey Harrison, family, and team were one of the first to assist in loading his mangled ride back into the trailer in the pouring rain when a storm came through right after the checkered flag. Those were a couple different memories that led to Neil coming back to the series in a different role. Nowadays, Gacom helps out with various inspection items in the pits throughout the day to make sure teams are following within the rules race-to-race. During the 2014 season, he even enjoyed passing on some of his knowledge to new series competitor Chris Wenzel and his family. Although these examples only scratch the surface in displaying the immense amount of team effort involved behind the scenes, it certainly shows the fact that each event would not run nearly as smoothly for the series or individual teams without each of the unsung heroes that participate. 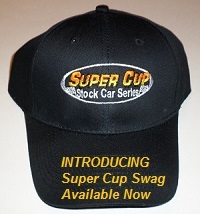 The Super Cup Stock Car Series headlines the fall lineup on MAVTV with each race airing on multiple occasions each week. Please visit mavtv.com for full listings of televised coverage of the 2016 SCSCS events. 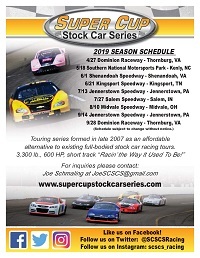 For news and developments over the off-season leading into 2017 please be sure to consult the official series web site at www.supercupstockcarseries.com, Super Cup Stock Car Series Facebook at www.facebook.com/SCSCSRacing, or Twitter @SCSCSRacing.